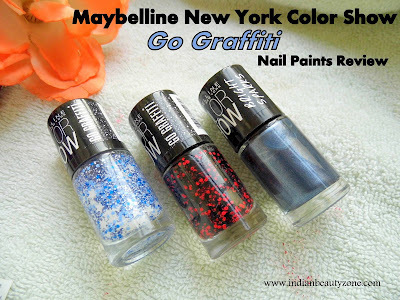 The Color Show Go Graffiti Nail Colors bring New York Street Art in a bottle to you. 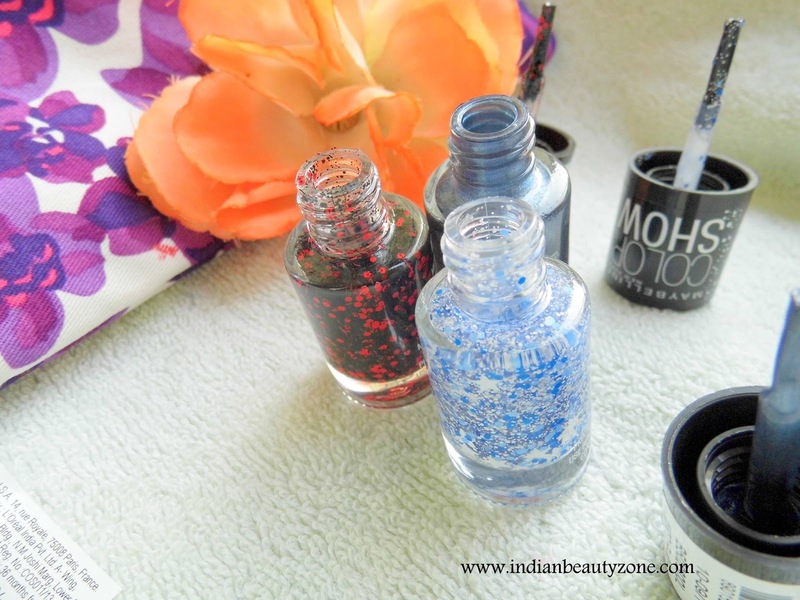 These nail paints comes in a cute small cylindrical like gloss packaging with a black lid. The lid has the applicator like all the nail paints have and the applicator is wide enough to spread the nail paints well on your nails within few application. Obviously it is travel friendly. The shades here I am reviewing are Star Struck and Red Splatter from Go Graffiti and the Spark of Steel is from Bright Sparks. The Star Struck shade is a colourless base with sky blue glitters and stars spreads in it. It is really amazing glitters that makes your plain nail paints vibrant, the white starts in it gives a glossy look for your nails. The Red Splatters shade has a colourless base with bright red black sparkle glitters, the glitters are in long and round shape. It is an another pretty shade to make your plain nail paints gorgeous. The Spark of Steel from Bright Sparks is an another awesome shade, it is not an glitter nail paint, but it is a shiny teal blue shade which can make your nails gorgeous alone and also you can top it up with either star struck or red splatter. The spark of steel shade makes a pluto planet look with red splatter shade. I have shown it in the picture. I really liked it very much. The nail paints are very easy to apply and aswell to remove. They stayed on my nails for really long time until I remove them with a nail paint remover. They gives a glossy finish and one to two coats are enough to make a glossy look for your nails. All these shades are my favorite and especially the Red spatter. All these nail paints can be used with any colour combination and it will surely looks pretty. 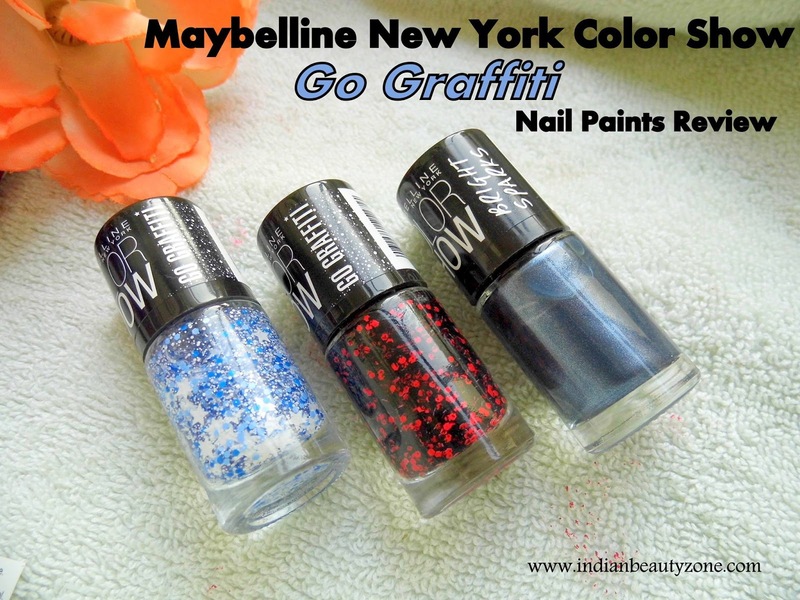 After the Color Show nail paints collection these Color Show Go Graffiti and Bright Sparks range will really worth to buy and must have for nail art addicts. You can make simple and gorgeous nail arts using these combos in a minute. 1. They are affordable when compared with quantity and quality. 2. There are beautiful shade collection to choose. 4. You can do mix n match or simple nail arts easily. 5. Easily available and travel friendly. 6. You can match the shades with any kind of outfit.